Just got a lovely nod from my client Loulerie mentioning that Harpers Bazaar have used one of the shots we did together recently. Congratulations to Loulerie for that. Studio Eight, 32 North Brunswick St., Dublin 7. D07 TWX3. Ireland. It is always a joy to meet people who are enthused about what they do. And so it is with the participants of the SuperValu Food Academy. I get to photograph participants occasionally. They are an exciting group of diverse individuals loving what they do. For me, as photographer, what makes it fun is not knowing where the photograph will be taken until I arrive at a location - and then the magic begins. Allowing the portrait to grow organically using the chosen location. Always coming away with a beautiful portrait of the participant with their product. Its been a treat. Thank you to all who sat for me. And sorry for not being able to fit you all ini below. It was great working with you all. Here is a selection from past work below. From left to right. Michael & Donal Birmingham & Derry Clarke - Gunmoo Kim - Eimear Fahy - Ivan Varian - Mindi Keane - Jack Fu - Maureen O'Donnell - Adam Hoban - Patricia Darcy - Augustin Mamba - Michelle Kinnear -Naveen Bachari. Remember where you saw them first. Is This Ireland's Most Handsome Postman? Spent a few hours in the studio photographing this handsome postman for An Post. Delighted to see An Post using it for their recently updated livery. 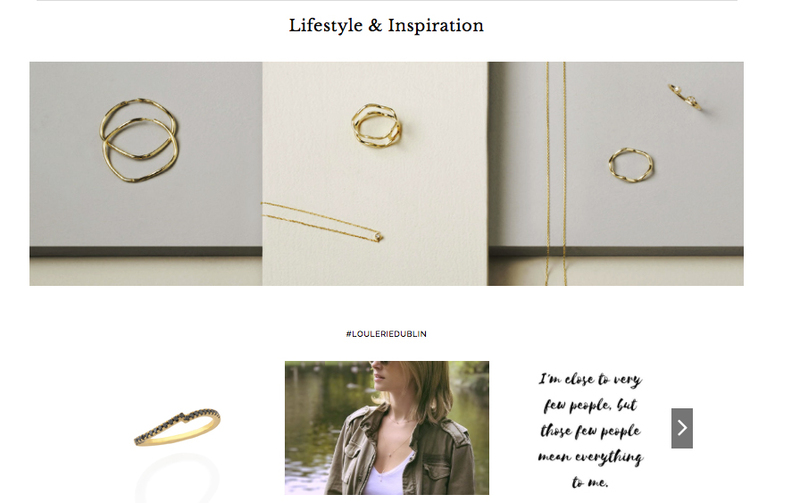 Louise from Loulerie contacted me to assist with the photography for their new web site. It was fun. From working out options and background to shooting the pieces. Photographing jewellery has its own challenges and we took them in our stride. Below you can get some idea of the preparation that we went through to get the final shots. And below some of the shots in use on the Loulerie web site. Evelyn did such a wonderful job both writing the recipes and food styling. Both savoury and sweet. Yum! 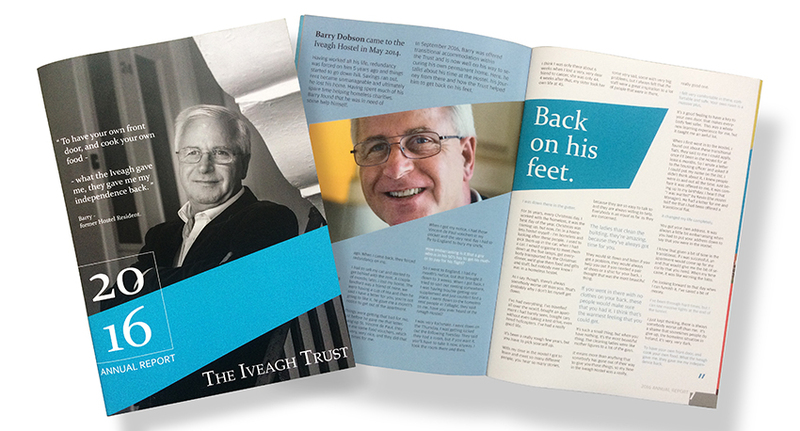 It is great to get to work with organisations like The Iveagh Trust. I've worked on some recent annual reports. The latest, 2016 Annual Report, is particularly pertinent to the housing crisis that we are experiencing in Ireland at present. Barry Dobson, seen here on the reports cover, tells of his own experience of living comfortably to redundancy to homelessness. And the road back via The Iveagh Trust Hostel and support. Barry is a charming articulate man. We spent a morning together in his transitional accommodation in the Trust and out and about around Bull Ally and St Patrick's Cathedral. It was a lovely way to spend a morning in really good company. The very best of luck to Barry in his future. 'I will astonish Paris with an apple...' said Cézanne a hundred years ago or more. So I gave it a try myself. Myself and Cézanne go back a long way. But much more importantly is the exhibition in The Copper House Gallery (http://www.thecopperhousegallery.com), in Dublin. They have collected a vast collection of work from artists and photographers - all donated. The Copper House has framed and mounted most of the pieces themselves at no expense to artist. All monies collected go straight to the Peter McVerry Trust. I have visited and the range of work is fantastic. And the prices have been kept low to move the work. I recommend you to go to this wonderful exhibition. And you might even get your hands on an original Eugen Langan. How good would that be? Listening to the radio over the last week and hearing that it was 40 years since Elvis died(or is he really dead? ), it reminded me of the time I was asked to photograph Elvis of Drimnagh. An avid Elvis impersonator with his wife and daughter photographed in their living room in the old Dublin suburb of Drimnagh. All fans of The King. The daughter with her Elvis suit was the third generation Elvis fan - all her grand parents and both parents being Elvis devotees. Celebrating Bastille Day 2017 in Dublin with Cuisine de France pop up shop on Camden Street. Try one of their very tasty 'Croffles'. A cross between a croissant and a waffle. Savoury or sweet, both are equally good. We worked together in the studio on a series of novel Croffle recipes to help kick off the very French Bastille Day celebrations in Dublin. 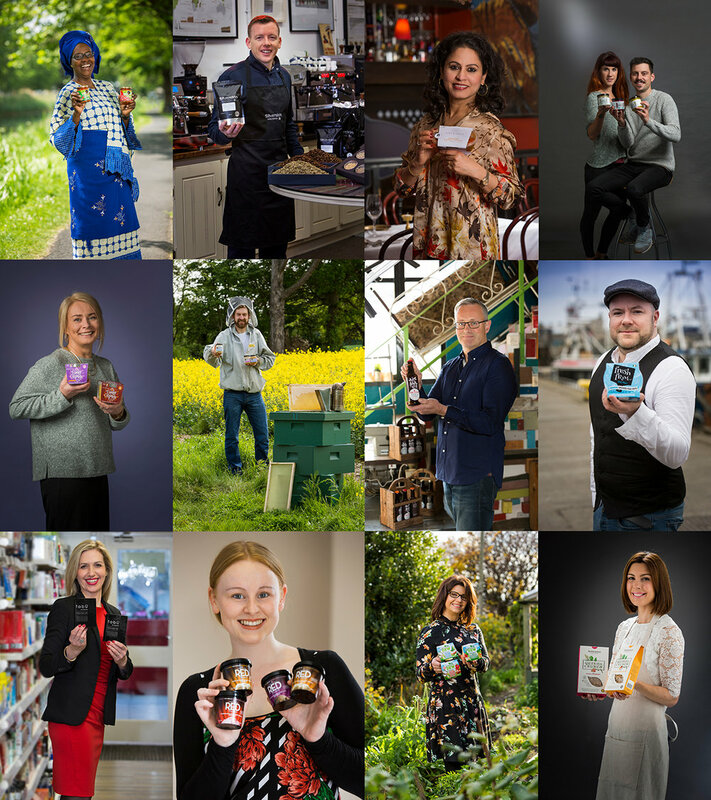 I met Mark Senn while photographing him for SuperValu backed Food Academy. His new vegan fish alternative left me thinking. I was skeptical. Up until I tasted it while photographing Vish for its new packaging. We shot Mark's portrait in his fantastic street side vegan restaurant, Veginity, off Richmond Street in Dublin. This image appeared while working in the garden. So pretty, I felt it worth uploading. If I was a photographer I would fancy myself as an industrial engineer. Redesigning everyday objects and getting the optimum from them both aesthetically and practically. One Off Design working with Dr Gearóid Ó Conchubhair they came up with this exquisitely designed and engineered Earo Chair. The chair is designed for concert musicians. If you ever notice the seats that concert musicians use are banal and ordinary and often lead to back pain and muscle strain. The new Earo Chair is ergonomically designed to support posture for musicians and design wise is miles ahead of any other chairs used by concert musicians. Is was fun photographing the chair and capturing the abstract shapes and modern design. It was even more fun having very talented musicians playing in the studio while we photographed them using the chair. A much maligned plant is the dandelion. What a great swath of colour dandelion brings across the country and in unkempt gardens in cities. A rich beautiful yellow flower that opens and closes with the sun. Then it leaves us with its beautiful seed clocks. We blew them as children in the hope that they would return to us as chocolate Easter eggs. You can use roots, leaves and flowers for different recipes. Here is a recipe for dandelion syrup made with dandelion petals. We picked the flowers in a suburban garden in Dublin city. Food Stylist Johan van der Merwe separated the petals...then boiled them in water for twenty minutes. Strain the petals and let the remaining liquid sit over night. Add approximately the same weight of sugar as liquid to the dandelion water and heat gently until it thickens. Store the syrup in sterilised air tight storage jars. Use instead of honey. For pancakes its a dream. Red Dog Design Consultants asked me to work on the cover of Kerry Group Annual Report. The brief was to photograph a selection of food stuffs and make them vibrant, colourful and mouth watering. We did some testing in the studio prior to the shoot days. We moved towards the idea of a selection of berries and fruits back lit with effervescent water bubbling through them. Nice. Shooting in studio with art director and designer from Red Dog, Susan Carberry and Food Stylist Johan van der Merwe. The finished Kerry Group Annual Report front and back cover. A selection of full page inside spreads shot during the same session. If you would like to discuss any aspect of photography do give me a call or send an e-mail. I'd be delighted to chat. Studio Eight, 32 North Brunswick Street, Dublin 7. D07 TWX3. Ireland.